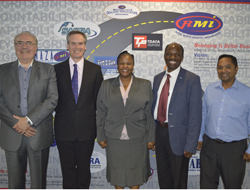 IMI experts have visited South Africa in order to build relationships with the country’s Retail Motor Industry Organisation (RMI) and to share expertise on apprenticeships, training and qualifications with state officials. During the visit IMI’s Dr Paul Spear, was a keynote speaker at the RMI “Rewards Just Ahead” conference held during Automechanika, Johannesburg on the 9th May. Dr Spear introduced the IMI’s Apprentice Return on Investment (ROI) research model to the South African motor industry including a demonstration of its practical online Apprentice ROI Calculator for use by employers and training providers. Dr Spear offered advice on recruitment and gaining maximum value from apprentices and other South African training initiatives such as Learnerships. Automechanika Johannesburg is the most important business to business automotive aftermarket event in sub-Saharan Africa in 2015. The mutual interests of the IMI and RMI and presence at Automechanika Johannesburg facilitated key meetings with senior executives from the Education and Training Authority and the South African Government Dept of Higher Education and Training. The IMI discussed with officials how it could help improve and develop automotive training in the country against IMI global standards. In a packed programme of high level meetings, the IMI was also able to meet with the Chairperson of SAMBRA (South African Motor Body Repairers Association) to discuss the national accident repair sector. International Business Development Manager Herbert Lonsdale commented: “We would like to thank the RMI for facilitating our visit to South Africa. The IMI and RMI’s goals in our respective countries are very similar and there is much to be gained from sharing knowledge and expertise we have gained in our own markets.